Well, I’m finally feeling somewhat better. Today, I went to class today for the first time since last Friday. Actually I only missed a couple of classes, though, because we had an ice storm Tuesday/Wednesday that cancelled some of my classes. The National Weather Service was predicting a “catastrophic” storm. It turned out not to be catastrophic, but there was quite a bit of ice and some VERY strong winds, followed by a little bit of snow. Today was odd because this morning it was only 10°F but it was bright and sunny with a beautiful blue sky. 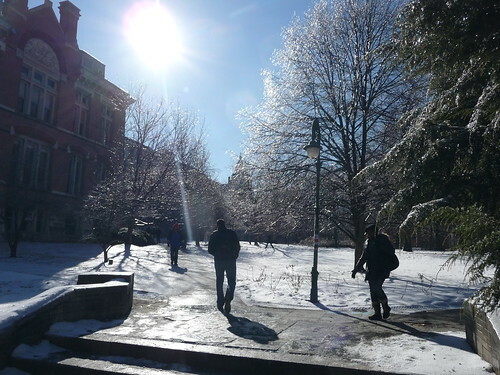 In many places the sunlight sparkled as it shone through the ice on the tree branches. I have to admit, my morning “commute” has not been pleasant since I started school. Of course, the weather has been harsh. But that’s only part of the problem. Before I started school, I could arrive at work, spread out my gloves and clothes and such and let them dry throughout the day. And I could sit in my cubicle and cool off while I worked, without anyone bothering me. Now that I’m a student, I go immediately into a crowded lecture hall and sit with people on either side of me. My gloves and such get shoved in my backpack. Some of my clothes never get a chance to dry, most days. It’s kind of disgusting, frankly. On days when it’s cold enough that I have to wear an extra layer of pants, I have to remove them by the bike rack and throw them in the milk crate on the bike. It’s awkward to say the least. It doesn’t help that I always seem to be in a hurry in the morning. I really should get up a little earlier, and then I wouldn’t have to stress about it so much. But I’m horrible at waking up any earlier than necessary. Today was worse than usual, because I still have lingering signs of illness and I had a couple of major coughing fits riding to class at 10°F. No fun. I don’t really intend to change anything, except maybe trying to get a slightly earlier start. I’ve thought about taking the bus sometimes, but the only one that goes near my house takes longer than riding, and it doesn’t really go very close to where I need to go. I really wish I lived closer to campus so I could come and go easier. As it is, once I’m there I have to stay there until I’m done for the day, and I have some awkward gaps in my schedule. So, I’m still adjusting. I’m still enjoying school, but I’m not thrilled with how riding to and from campus is working. Actually, it’s the TO part that’s the problem. Riding home at the end of the day is almost always enjoyable. Getting up and rolling out into 10 degrees takes more than average motivation. Hopefully, when the weather improves it make a big difference for you. Is there a cafe on campus? When I first started commuting to work I would motivate myself to get up early so I could co down and enjoy some quiet time before my day started. Cafe was close enough to the office – so I could walk the bike over with what was left of my coffee… made a help of a difference in my day. Good luck. You’ll sort it out over time. Wow. Typing on my Android phone needs to improve. Pondero: I do think that will help, yes. Mike: That’s a really good suggestion. There is a cafe, and it’s not too far from most of my morning classes. I think a little time to cool off before class might be just what I need. PaddyAnne: Wow, that sounds pretty involved. It could work, but I’ve already got more than I really want to carry around. Plus, sitting on a big jelly roll of wet clothes and towels is going to make me look like even more of a freak than I already am. Good thoughts, though, thanks! Here’s another suggestion. Most schools have some sort of athletic facilities and locker rooms available to students. Check to see if it’s a low-cost/no-cost option to have a shower and lockers available. It’ll take a few minutes extra in your morning, but in my mind well worth it! Imagine that commute come Springtime. Just picture it.